Stephen Curry scores 38 points for Golden State. 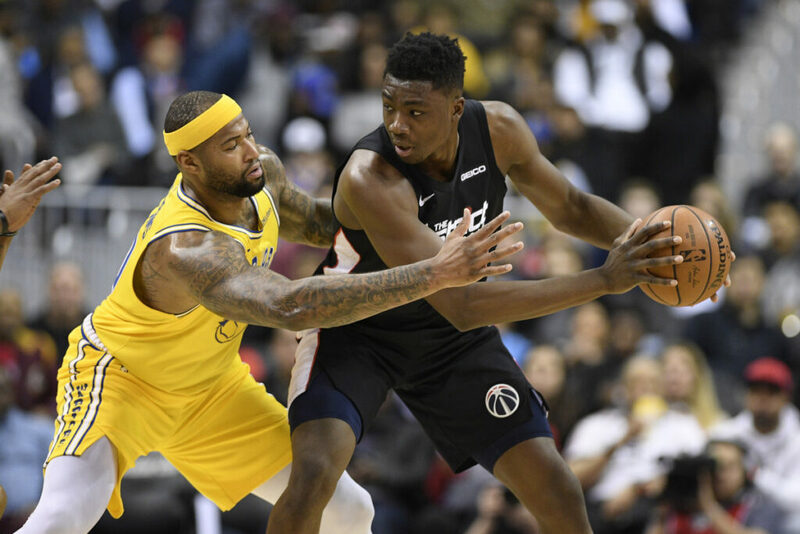 WASHINGTON — Stephen Curry scored 38 points, local product Kevin Durant had 21 and the Golden State Warriors hammered the ball inside to beat the Washington Wizards 126-118 Thursday night for their season-high ninth consecutive victory. The two-time defending NBA champions put up 70 points in the paint after shooting 1 of 6 from the outside in the first quarter. Curry was at the forefront of Golden State’s drive-the-paint strategy as he made just two of his eight 3-point attempts and was 12 of 16 inside the arc. Durant, from nearby Suitland, Maryland, was 9 of 18 from the floor. Center DeMarcus Cousins had 17 points in 24 minutes in his third game with the Warriors since missing almost a full year with a ruptured left Achilles tendon. Cousins was a matchup nightmare in the post against Washington, which went with a small lineup for most of the night. Trevor Ariza led the Wizards with a season-high 27 points. THUNDER 122, PELICANS 116: Russell Westbrook posted his NBA-leading 15th triple-double of the season and host Oklahoma City beat injury-depleted New Orleans. Westbrook finished with 23 points, 17 rebounds and 16 assists for the 119th triple-double of his career. The Thunder improved to 10-5 this season when he gets one. Paul George had 23 points and 11 rebounds, and Steven Adams added 20 points and 13 rebounds for Oklahoma City, which won its fourth straight. The Pelicans were without star center Anthony Davis, who missed his third straight game with a left index finger sprain, and the team announced that Nikola Mirotic will be out at least a week with a right calf strain. ALL-STAR GAME: LeBron James of the Los Angeles Lakers is a captain and an All-Star starter – again. Giannis Antetokounmpo of the Milwaukee Bucks will choose his own teammates as the other captain. And Hornets guard Kemba Walker is about to make his first All-Star start, on his home floor in Charlotte. While there were perhaps mild surprises, there were no real stunners during the unveiling of the starters for the NBA All-Star Game that will be played in Charlotte on Feb. 17. James and Antetokounmpo are captains, their perk for being the leading vote-getters out of the Western and Eastern Conferences, and nine of this year’s 10 starters have been chosen to begin All-Star Games in the past. Walker is the lone exception, and broke into a smile when realizing he was a pick. “It’s kind of surreal,” Walker told TNT during the broadcast to announce the starters. The starting guards from the East are Boston’s Kyrie Irving and Walker. The East frontcourt picks were Antetokounmpo, Toronto’s Kawhi Leonard and Philadelphia’s Joel Embiid. From the West, Stephen Curry and reigning NBA MVP James Harden were the picks at guard, with James, Golden State’s Kevin Durant and Oklahoma City’s Paul George getting the frontcourt spots. NETS: Guard Spencer Dinwiddie is being evaluated for a right thumb injury. The team gave no other details about the injury to Dinwiddie, one of the keys to their surprising run to sixth place in the Eastern Conference. They said more information would be provided after the diagnosis had been completed. SUNS: Guard Devin Booker was fined $25,000 for escalating an on-court altercation by pushing Minnesota Timberwolves center Gorgui Dieng in the face on Tuesday night.